In the southernmost part of France, just before the Spanish border, between the wild and rugged mountains of the Corbière and the northern foothills of the Pyrenees lies the mountain range of the Fenouillèdes. 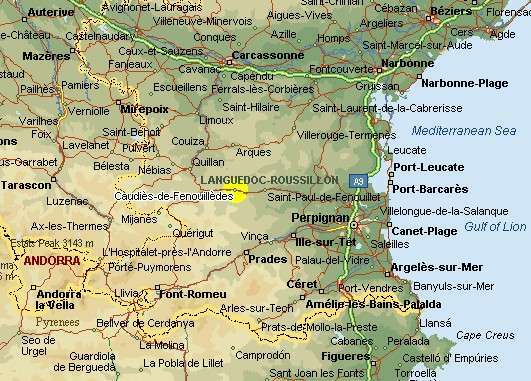 This is the northernmost part of French Catalonia, known as the legendary country of the Cathars. In this southern part of the Languedoc-Roussillon (Departement Pyrenees-Oriental, Aude), where countless ancient vineyards mingle with the wild and untameable forces of nature, wild rivers, gorges, wind and mountains blend into a unique landscape composition. What's more, the mild influence of the nearby Mediterranean is clearly tangible - creating a truly rare and exquisite natural ambiance. In the heart of this wild, romantic landscape lies the small wine-producing village of Caudiès de Fenouillèdes, home of Relais de Laval. Still a productive winery until 1934, Cave Ancienne, has been converted into a charming Guesthouse - Relais de Laval. The architectural style of the historic buildings (ca. 1880) has been preserved through meticulous craftsmanship. Now Relais de Laval is ready to offer visitors a variety of comfortable and fully air-conditioned accommodations throughout the year. The characteristic ambiance of the lodgings is perfectly adapted to the environment: rustic on the outside with a touch of modern elegance on the inside that not only satisfies all the usual requirements, but also accommodates the special needs of disabled people in terms of customized fittings and interior design. Thanks to its ideal geographic location within close vicinity of many of the most beautiful and impressive sites of the Pyrenees Oriental and the department of Aude, Relais de Laval provides the perfect holiday base from which to explore this diverse and ever surprising landscape with all its cultural treasures. Situated just 45 km from Perpignan, the last big town before the Spanish border, Relais de Laval is neither far from the Mediterranean coast (40 min), nor from the high peaks of the eastern Pyrenees and the independent province of Andorra. Yet, surrounded by wine villages, Cathar castles and the fragrant hillsides of the Garrigue, the location of Relais de Laval is just as idyllic as it is central. Despite the excellent traffic connections to Perpignan and Carcassonne (both offer international flight connections within an hours' drive, as do the airports of Toulouse, Montpellier, Barcelona, Gerona, which can all be reached within 2½ hours by car) this enchanting region has remained almost untouched and defying modern progress, has preserved its original rustic charm. The signs of the past are apparent everywhere, yet one is often surprised by the gracious merging of past and present and between nature and culture. Nature-lovers and walkers will find the awe-inspiring, dramatic scenery a true holiday paradise. Families with children will discover countless opportunities for exciting excursions, no matter the weather. Neither sports and fun nor nature or culture will be in short supply. Gourmets and wine connoisseurs will be amazed by the variety of local wines and delicacies. Whether you simply wish to lay back and relax, discover people and places, or seek exciting adventure sport thrills - the southern Languedoc Roussillon can hardly be surpassed in its diversity of natural and cultural treasures and countless opportunities for all types of leisure activities.